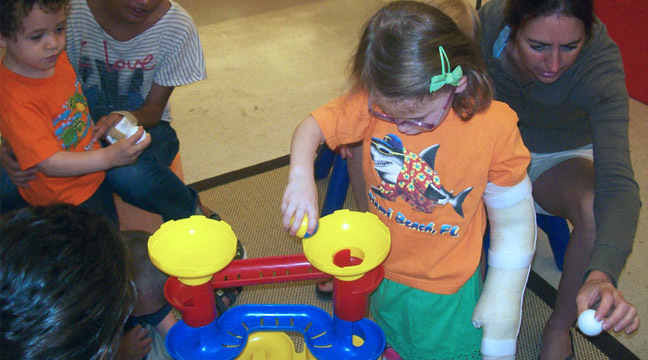 Winter Camp Helping Hands is designed for children with hemiplegia of an upper extremity. The program is dependent on each child’s ability to tolerate therapy, and we have had children as young as 15 months participate in the camp. It is based on the evidence of research involving constraint-induced (CI) movement therapy for children with Cerebral Palsy and adults who have had a stroke. Programming is for at least 4 hours per day, 5 days per week for 4 weeks. Occupational therapists work directly with each family to provide therapeutic activities, which helps facilitate carryover and continues the benefits of therapy at home. CI therapy is a group of therapies designed to restrain the use of the unaffected upper extremity and encourage the use of the affected upper extremity through practice. A removable soft-cast with straps is custom made for each child for the unaffected upper extremity. All activities are age-appropriate, fun and therapeutic for the child. Even snack time is eaten with the cast on! It is recommended to discuss this alternative delivery method of intensive therapy services with your physician, therapist and family members to determine appropriateness, timeliness and efficacy. The primary goals of the camp are three-fold: to increase functional use of the hemiplegic upper extremity, to use BOTH hands together better and to have FUN.